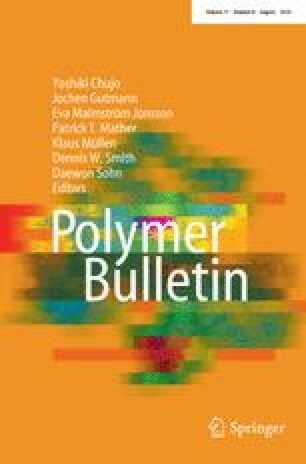 In this paper, natural rubber (NR)/ultrafine full-vulcanized styrene–butadiene powdered rubber (UFPSBR) blends were prepared and studied for the first time. Scanning electron microscopy and thermogravimetric analysis were employed to characterize UFPSBR. Equilibrium swelling method was used to determine the crosslink density of NR/UFPSBR vulcanizates. The results on mechanical properties showed that when NR/UFPSBR ratio was 100/5, the formulation exhibited favorable performances compared to pure NR vulcanizates. The heat build-up temperature also decreased after adding UFPSBR into the NR formulation. In dynamic mechanical analysis, in the temperature range of −10 to −5 °C, loss factor (tanδ) values of NR/UFPSBR vulcanizates showed an increasing trend over the given temperature range and exhibited a peak value at approximate −5 °C. This indicates that wet traction and rolling resistance of samples were improved after UFPSBR was added in NR. This research demonstrates that UFPSBR can be incorporated into a conventional NR formula to successfully improve the comprehensive performances and dynamic mechanical properties of NR formula. The authors thank Professor Shan Shi on the help of SEM analysis and critical comments on the manuscript and Mrs. Jing Zhang on the help of TG analysis. The authors also thank Dr. Erica Sharpe and Dr. Rıfat Emrah Özel on discussion and correction of the manuscript. The authors appreciate the reviewers’comments on the manuscript.